*Visible minority: self-identified as belonging to a racial or cultural group other than “White” (does not include Aboriginal). **Recent immigrant: at least one parent reported that they had become a landed immigrant in Canada in the 10 years prior to the survey. Recent Immigrant- use with caution. ***LICO (low income cut off) data based on postal code information.Low and high scores were determined by the 10th/90th percentile cutpoints (as appropriate). Children under 6 in rural communities were more likely to live in neighbourhoods that their parents felt had low levels of neighbourhood safety1 than were those living in urban areas. 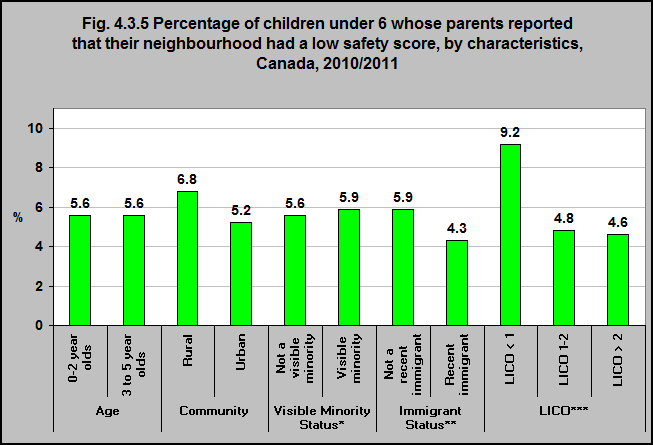 Children who were not recent immigrants were more likely to live in neighbourhoods that their parents felt had low levels of neighbourhood safety than were recent immigrant children. Children living in the lowest income group were more likely to live in neighbourhoods that their parents felt had low levels of neighbourhood safety than those in higher income groups.